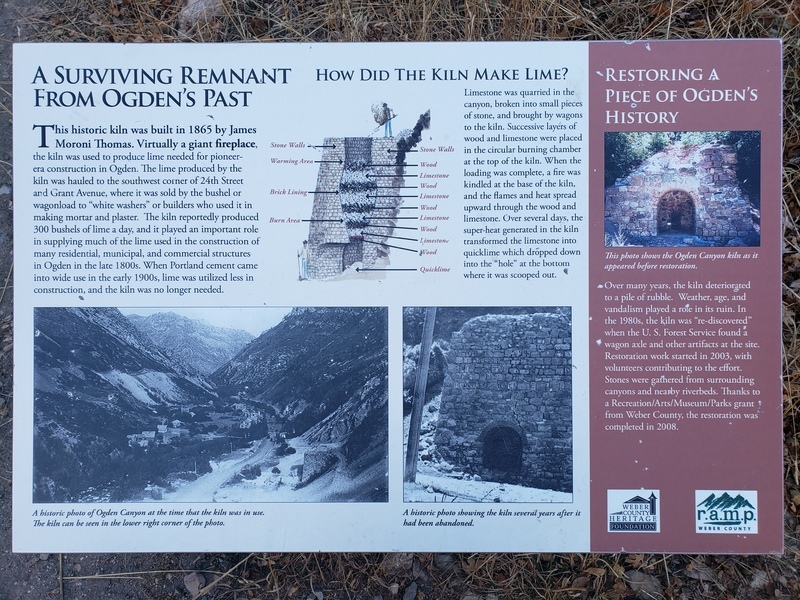 The lime kiln in Ogden Canyon has been restored as a reminder of the importance of such kilns in the building of structures in the Ogden area. The lime kiln, built in 1865, was one of several kilns that produced lime for mortar, plaster, and other materials essential in many of Ogden’s early buildings. It resembles a large fireplace with a pot in the center. Limestone from the large natural deposits in Ogden Canyon was layered with coal or wood and the mixture was heated over an open flame and the resulting lime was crushed to powder. The lime was sold from large bins in downtown Ogden to local builders. After Portland cement became the favored material for buildings, the lime kilns were abandoned. According to Moroni Thomas who wrote his history in 1934, his father J.M. 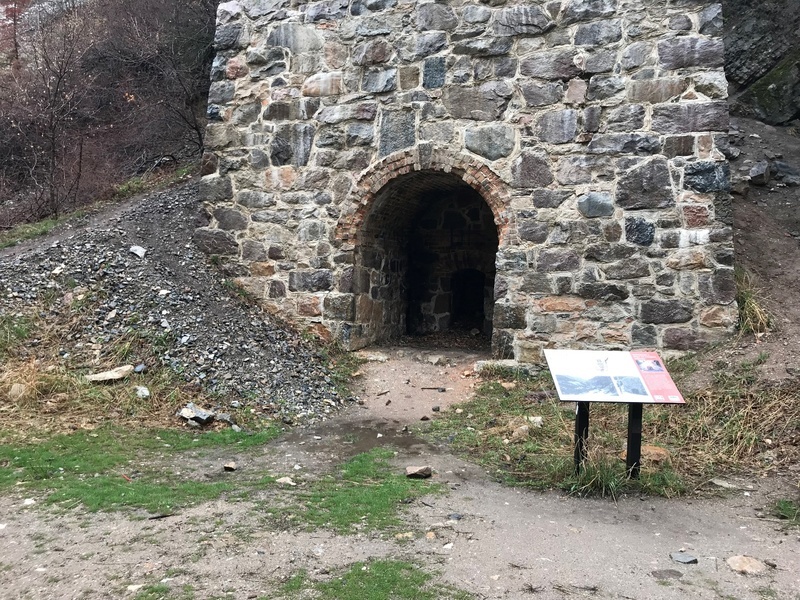 Thomas helped build this lime kiln, the second in Ogden Canyon. 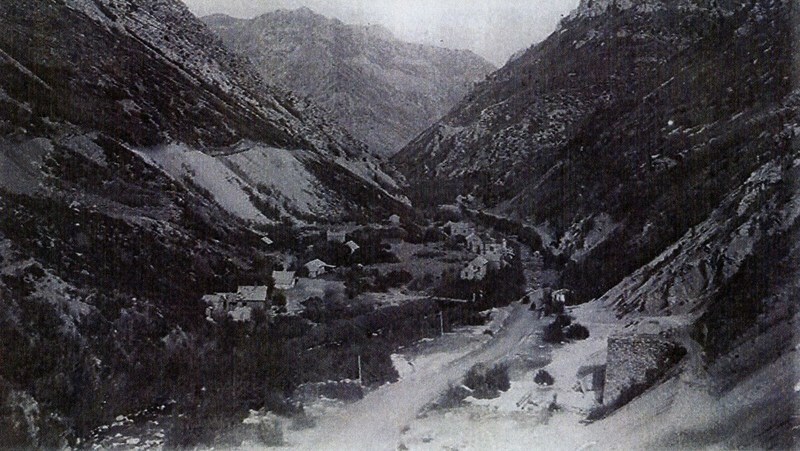 The Utah Powder Mills were located just north of the kiln. There were nine separate buildings used as crushing mills, amalgamating houses, and mixing press houses in the manufacture of black powder which was used for blasting in the early mines of the area. However, when the explosion destroyed the compound in 1883, it was never rebuilt. By the time the Ogden Canyon Club discussed saving the kiln, not much of it was left. Most of the original stones were gone. With the help of small grants, the Ogden Canyon Club and the Weber County Heritage Foundation were able to hire brother and sister team Cody and Kellie Wright to rebuild the kiln, with help from a stonemason, Brock Cheney, and students from the local technical college. The small amounts of money raised spread the restoration work over several years, but a final grant of $30,000 from the Weber County RAMP fund provided enough funds to finish the job. The lime kiln was dedicated in 2008 with a ceremonial fire – the first in over a century. The patience and hard work put into this project serve as an important example of what can be done for other landmarks that might otherwise be lost to history. 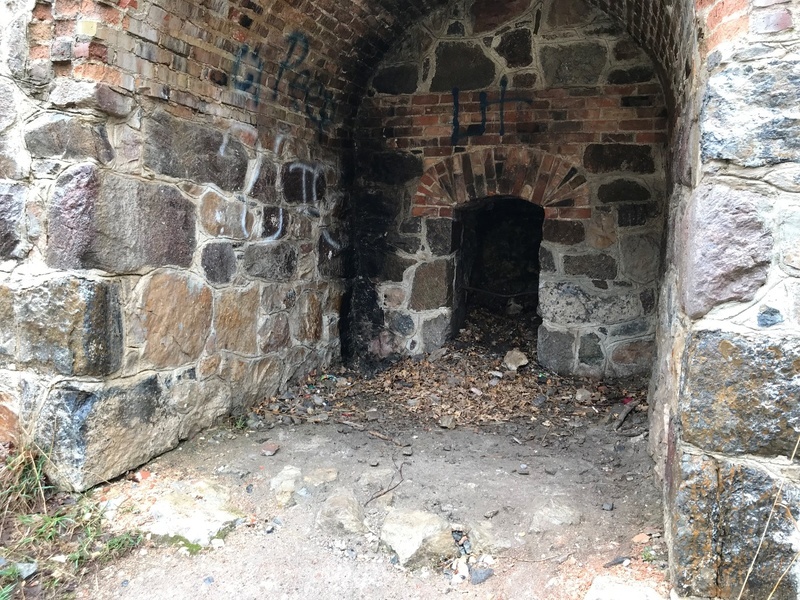 Restored Lime kiln ~ Source: In possession of author. 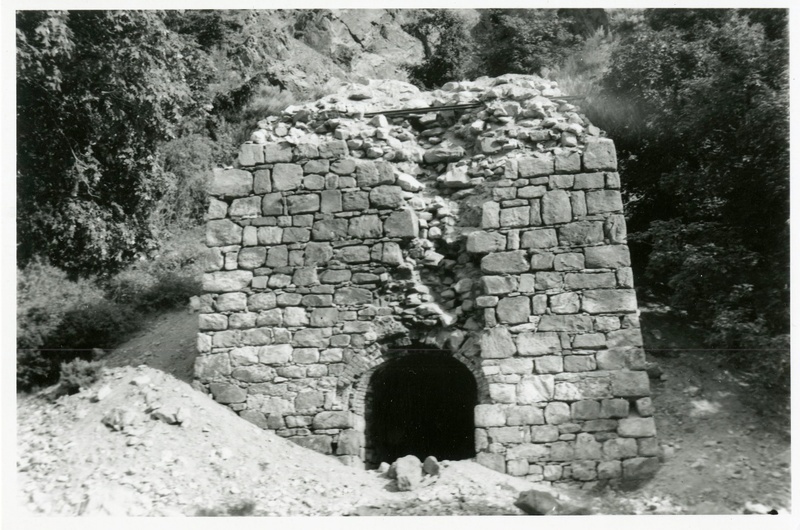 Lime kiln prior to restoration ~ Source: Special Collections, Stewart Library, Weber State University. Inside the restored kiln ~ Source: In possession of author. 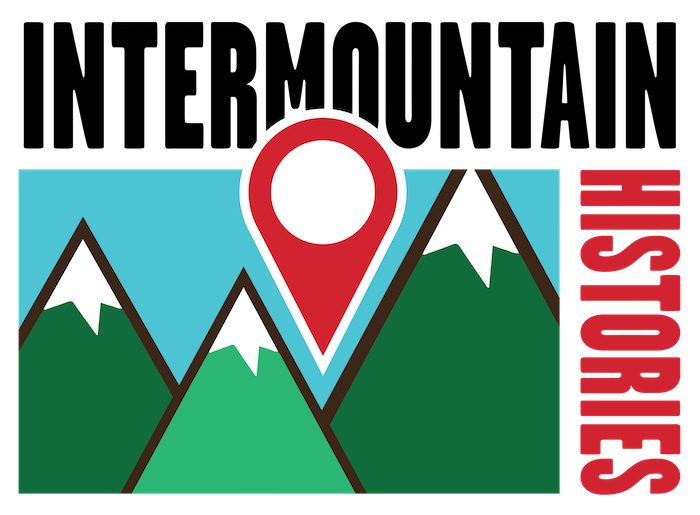 ,” Intermountain Histories, accessed April 20, 2019, https://www.intermountainhistories.org/items/show/264. Trentleman, Charles. The Standard Examiner, “Firing History: Historic Lime Kiln, Built in 1865 in Ogden Canyon, Nearly Restored,” 17 November 2008.